So we thought – why not offer a choice of gas storage options? You can take your pick between our underground tank, above ground tank or gas bottle option. As the UK’s leading LPG supplier, we’re experts in knowing which storage option would best suit you. So we're here to help you make the best decision for your home. 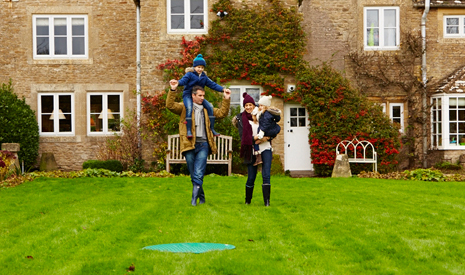 For a nominal fee, we’ll take care of it all – from installing to maintaining your LPG tank. Passionate about keeping your view unspoilt and maximising your garden space? If the answer's yes then our underground tank could be the perfect solution for you. The only thing you'll see is a handy green cover which lets our delivery driver effortlessly refill your tank. What are the specifications of an underground tank? 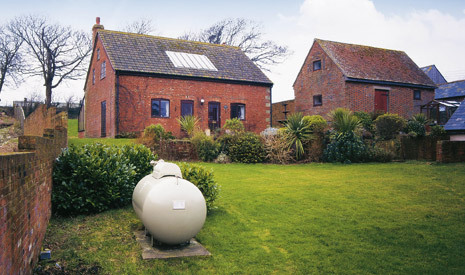 Our standard underground LPG tank sizes are 2100 or 4000 litres. But don't worry, one of our energy specialists will pick the most suitable size for you. In fact, the whole LPG installation will be undertaken by our expert team, so you don't have to lift a finger. Can I have an underground tank? 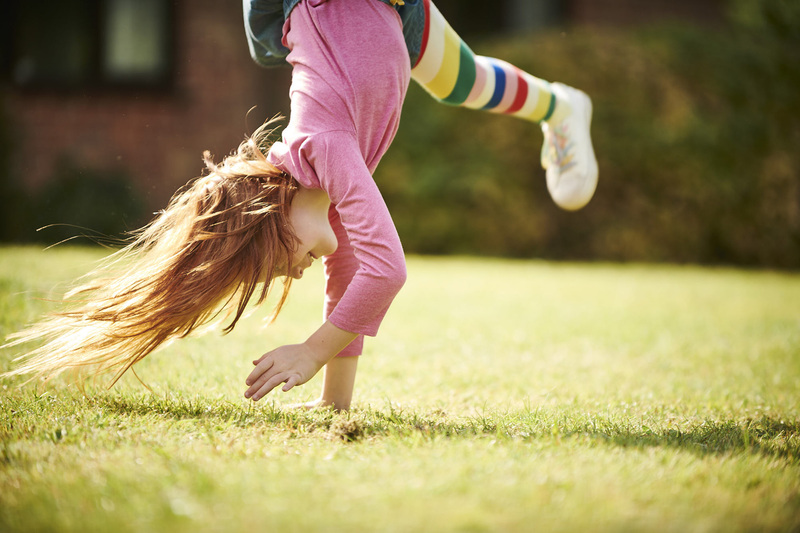 When a Calor energy specialist visits your home, they’ll check to see if your garden is best suited to an underground tank. Here’s a few siting requirements for our underground tanks. But don’t fret, one of our expert energy specialists can check these for you. The turret of your tank must be at least 3m away from buildings, boundaries and fixed sources of ignition. The excavation must also be 2m away from any buildings. Your tank cannot be sited directly underneath electrical power cables, and no services can pass through the excavation, including water pipes. We recommend using the excavated material, with any sharp stones removed, as backfill once your underground tank has been sited. Your tank must be accessible for deliveries – this requires a minimum access road and gateway width of 2.75m, safe access for our driver to get from his vehicle to the tank and direct line of sight for the driver to be able to see his vehicle whilst he is standing at the tank. Once your LPG tank has been installed; the land above the tank may be turfed, shingled, etc; although no continuous concrete or tarmac covering can be used. The area immediately around your tank should remain clear of debris, overgrown vegetation and fixed sources of ignition such as barbecues. 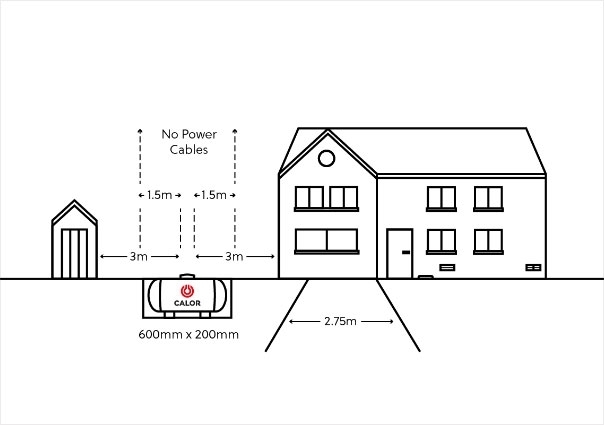 Your underground LPG tank requires a trench of a minimum depth of 600mm and minimum width 200mm for the underground pipework to be installed. Any cables or other services must be separated by 250mm from the LPG pipework. An above ground LPG tank makes the flawless fit for most gardens – and the tank is an easy install, too! Ideal for many homes, our above ground storage tank is installed on a concrete or prefabricated base. What are the specifications of an above ground tank? Our standard above ground LPG tank sizes are 1200 or 2000 litres. But don't worry, one of our energy specialists will pick the most suitable size for you. In fact, the whole LPG installation will be undertaken by our expert team; so you don't have to lift a finger. Can I have an above ground tank? When one of our energy specialists visits your home, they’ll check to see if your garden is best suited to an above ground tank. Here’s a few siting requirements for our above ground tanks. But don’t fret, our expert energy specialists can check this for you. Your LPG tank must be 3m away from buildings, boundaries and fixed sources of ignition. 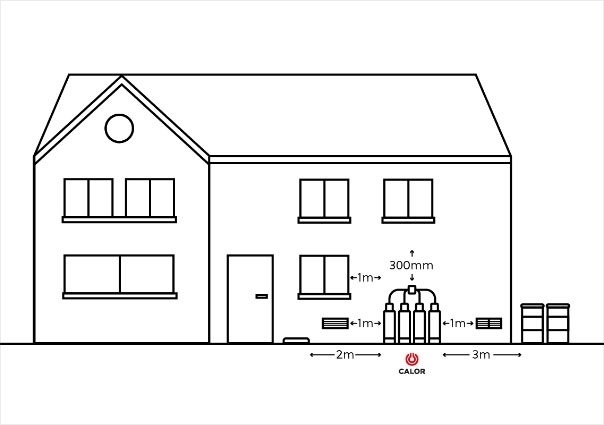 If your property does not allow these distances to be met, one side of the LPG tank can be reduced to 1.5m with the use of a suitably designed ‘fire wall’. We would advise that such a fire wall should be precisely specified by an energy specialist. Please note that the other three sides surrounding the tank must have a 3m clearance. As LPG vapour is heavier than air, your tank should not be positioned within 3m of unsealed drains or gullies. 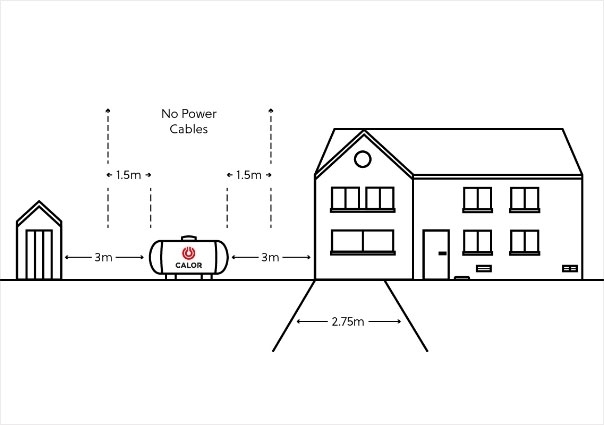 Your LPG tank must be 1.5m away from overhead power cables. Once your LPG tank is installed, the area surrounding it needs to be kept free from debris, overgrown vegetation, trees, sheds or fences within 3m. Your tank can be shielded from view using an appropriately designed and maintained screen, if desired, although the screen must be a minimum of 1m from the tank and cannot hinder tank ventilation. If you don't have the room for a tank, or you'd rather not get one installed, our gas bottle solution could be the one for you. If you're limited on outside space, and you don't have the room for a tank, our gas bottle solution is the perfect alternative. 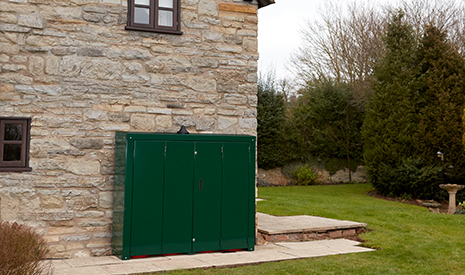 Gas bottles can be housed in a subtle storage unit and a change over valve automatically switches from one gas bottle to another, giving you continuous gas supply. What are the specifications of our gas bottles? Four of our 47kg gas bottles hold around 370 litres of gas. You’ll be pleased to know that our gas bottles can be placed in most locations, making them an easy choice if you don't want or can't have an LPG tank. Can I have gas bottles? Your gas bottles must be sited against a wall or building structure with at least 30 minutes fire resistance. They must be positioned on firm, level ground in a well-ventilated area, where they are reasonably protected from accidental damage or interference, and remain accessible at all times. Propane bottles must be stored outside, and not in cellars or basements or in sunken areas. There needs to be a minimum of 1m horizontally from the nearest gas bottle valve to fixed sources of ignition, unprotected electrical equipment, excessive heat sources or doors, air bricks, ventilation ducts, flue terminals and openable windows. There needs to be a minimum of 2m horizontally from the nearest gas bottle valve to untrapped drains, unsealed gullies and openings to cellars. The area around your gas bottle needs to be kept clear of litter, vegetation or flammable materials. Cylinders must not be located within 3 metres of any corrosive, toxic or oxidising material.